Looking to track the activities of your logged in users of your website? MonsterInsights offers two types of user tracking: User ID tracking with the built-in Google Analytics feature and user tracking by setting up a custom dimension. In this article, we’ll explain two types of visitor tracking offered by MonsterInsights. What is User ID Tracking? What is Logged In Custom Dimension Tracking? What is User ID Tracking in Google Analytics? By default, Google Analytics identifies every user of your website by assigning them a unique ID known as Client ID. The Client ID represents the unique device from which users engage with your content. That means if a unique user browses through your website from two different devices, it will be counted as two different users, not a single user. By enabling User ID tracking with MonsterInsights, you can track individual logged in users more accurately even if they visit your site from different devices. This way, you can accurately track the engagement data of each unique user of your website and discover how they interact with your content from different devices and multiple sessions over an extended period of time. How does MonsterInsights User ID Tracking Work? Instead of using the Google Analytics Client ID, MonsterInsights uses the unique WordPress user ID of each individual user, so you can easily keep track of logged in users in your Google Analytics reports. To find the WordPress user id of your users, just go to your WordPress dashboard and click on Users » All Users. Then, hover your cursor over the user you want to find the ID for. You’ll see a URL appear at the bottom of your browser. In the middle of the URL, it will say “user_id=”. The number after that is the user’s ID number. You can click the Edit link under the username to make sure. You’ll see the user ID in the web address on the edit page. MonsterInsights replaces the anonymous Client ID with this WordPress user id with just a few clicks. Refer to this guide to learn how to enable user tracking in Google Analytics. 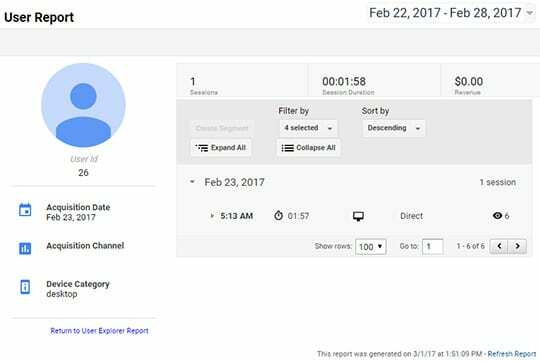 You can find the User ID tracking report by navigating to Audience » User Explorer in your Google Analytics account. You can click on the User ID to see more detailed info on each user. What is Logged in Custom Dimension? The Logged in custom dimension keeps track of whether your visitors are logged in to your site or not. However, it doesn’t track individual users. 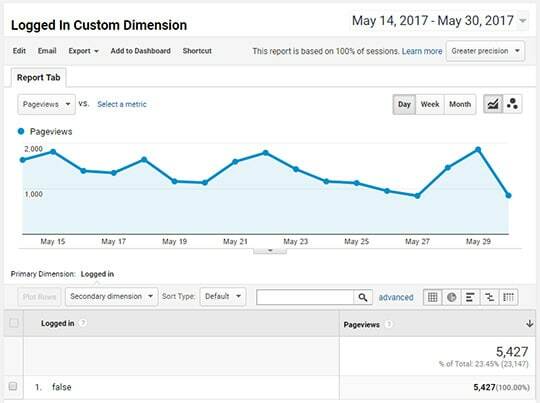 In Google Analytics, custom dimension allows you to create a custom report, so you can choose Logged in as your primary dimension and customize the report per your needs. You’ll have to set up a custom dimension with Logged In as a dimension type using our Custom Dimensions addon. For more help, you can learn how to set up custom dimensions. Prerequisites: You will need to have the Pro Tier or higher of MonsterInsights installed. Step 1: Navigate to Insights » Reports » Dimensions. Step 2: Select the desired date range. Step 3: Scroll down to your logged in sessions report. You can create your custom dimension report by creating a custom report in Google Analytics. Your report will show you whether your visitors are logged in to your site (“true”) or not (“false”). Below are a few differences between User ID tracking and Logged In Custom Dimension. Individual User Tracking: With User ID tracking, you can track the activity of each individual logged in user separately. However, the Logged In custom dimension only allows you to view logged in vs. not logged in visitors as a whole. Setup: To set up User ID tracking, you don’t need to use any MonsterInsights addon whereas to set up Logged In custom dimension, you’ll need to install Custom Dimensions addon. 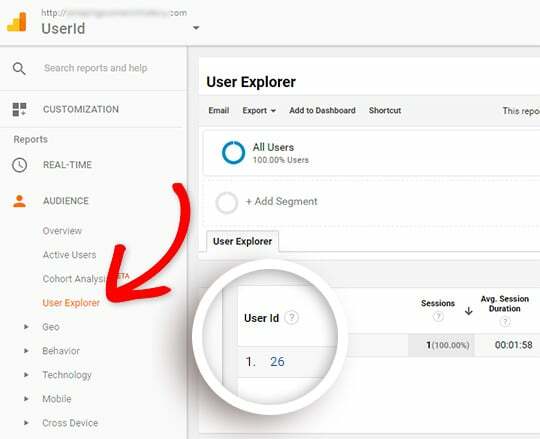 Finding Report in Google Analytics: You can find the report for User ID tracking only in the User Explorer page. However, with Logged In custom dimension, you can easily create a custom report. We hope this guide helped you to learn the differences between User ID tracking and Logged In custom dimension. You might also want to set up site search tracking, which provides you important insights on user interaction.